I still don’t have Tom Petty’s new album, which I have said I would purchase as soon as it hit the discount rack. That may be a while. You may have thought that one of my close local friends would have gotten it for me for my birthday or holidays, but no. Since most don’t even read my blog I can say whatever I want about them and have gotten a dig in before that went unnoticed. I will again when so moved. Like now. This though is no reflection on my old friend who runs a bar up in Chelsea and has loaned me some very important vinyl, and also provides me the opportunity to say that I have an old friend who runs a bar up in Chelsea. 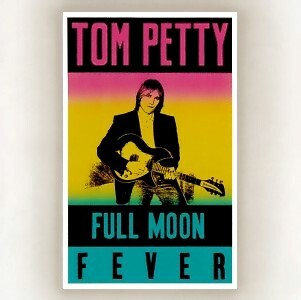 I did find Full Moon Fever, Petty’s first release sans The Heartbreakers, but filled with Wilburys, to be enjoyable, though not as much as the first record by the whole group that we listened to a short while back. This does contain hit songs like “Free Fallin,” “Yer So Bad,” The Byrds’ “Feel A Whole Lot Better,” which sounds more like The Seekers I think, and “Runnin Down A Dream.” It may or may not make it out again for a workout, probably more for company, but what I find puzzling is that the inside booklet is dotted with half moons. Why is that do you think when the album is called Full Moon Fever?